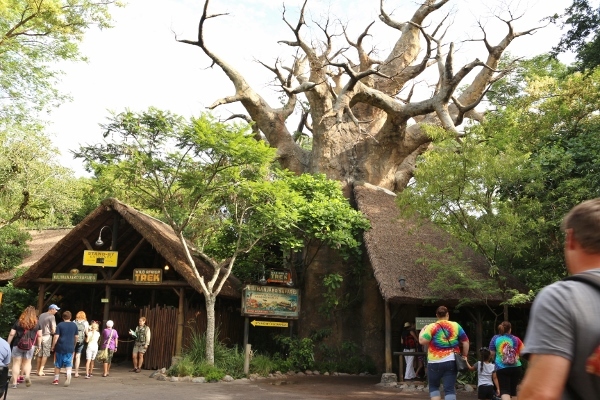 Have you ever visited Disney's Animal Kingdom and noticed a group of people dressed in vests and harnesses, and being lead by a guide near Kilimanjaro Safaris and the Pangani Forest Exploration Trail? 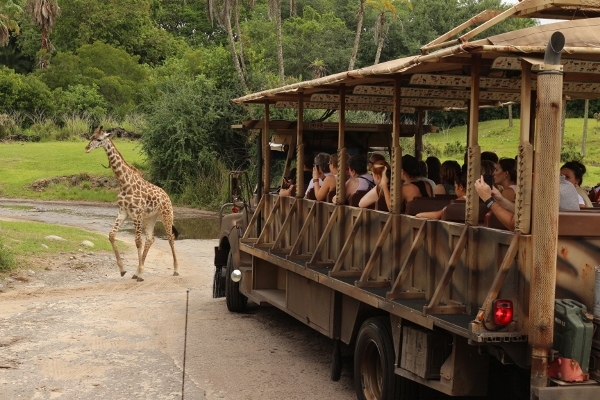 Well those folks are part of a special VIP "backstage tour" at the Animal Kingdom called Wild Africa Trek. Valid park admission is required for this experience, and the price for the tour itself currently ranges from $189 to $249 (before tax) depending on the season. 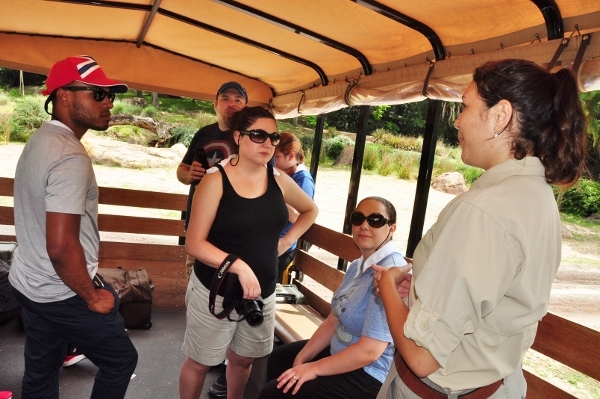 Some discounts MAY be offered for afternoon treks seasonally, or if you are a DVC member. Treks are presently offered at the following times: 8:00 am, 8:45 am, 9:30 am, 10:15 am, 11:45 am, 12:30 pm. We signed up for a 9:30 am time slot. This 3-hour tour is truly a once-in-a-lifetime experience. 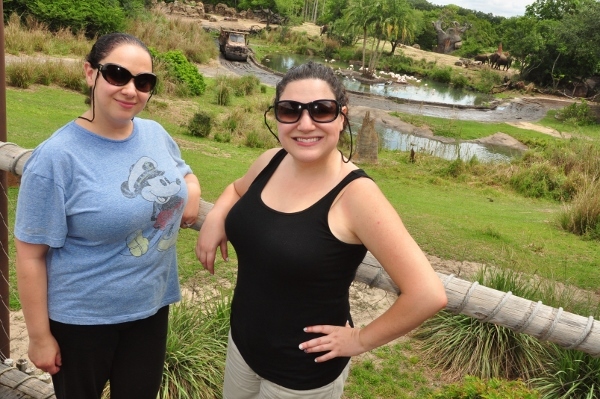 You first check in next door to the entrance for Kilimanjaro Safaris. You're given a locker to store your belongings, and strapped into a harness. Closed toe shoes are required for this expedition, and anything brought on the tour must be strapped to your person. That means cameras or cell phones must be attached to your vest, or hung around your neck. A lanyard for your glasses is provided so you can hang them around your neck, and you also receive a keepsake water bottle to help keep you hydrated on the trek. 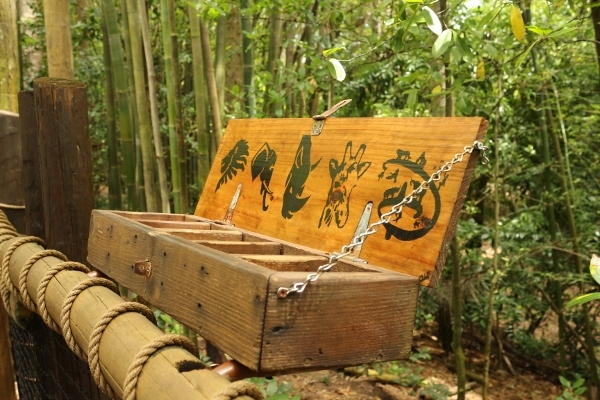 The staff also provides some bug spray and sunscreen in case you forgot your own. Both are highly recommended! 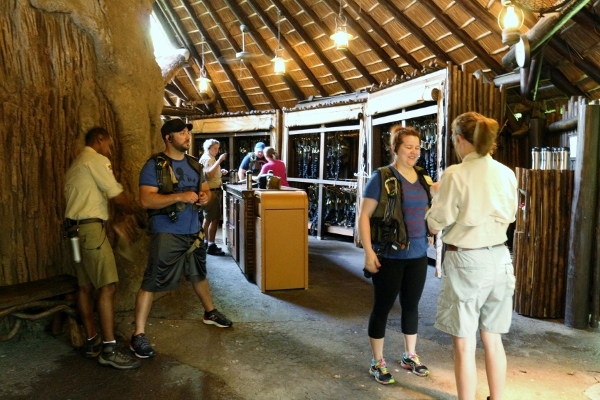 They will fit you with an earpiece as well, so you can always hear the guides throughout the tour. 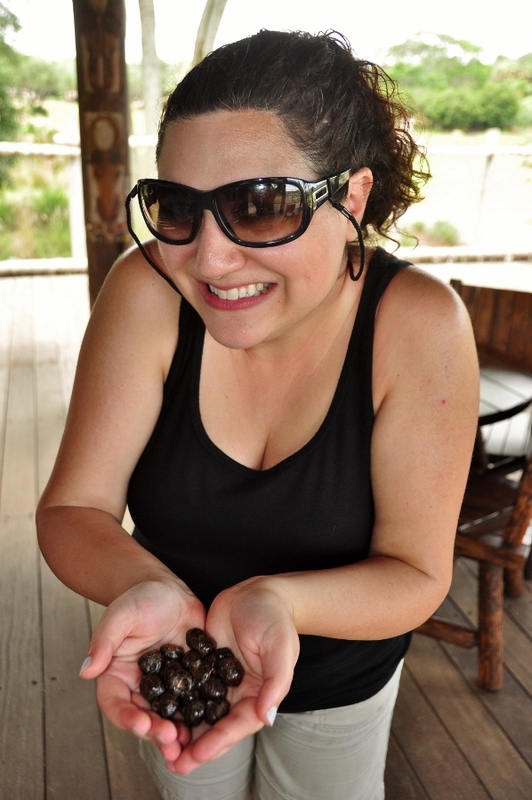 Then you get to meet your tour guides. Ours were absolutely fantastic! 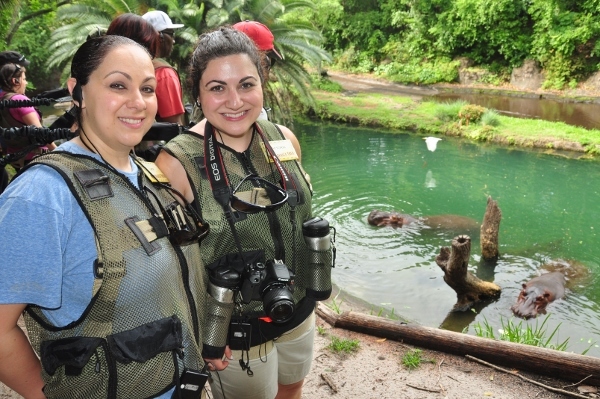 Emily and Olivia did a wonderful job, were very knowledgeable and friendly, and took TONS of great photos (both candid and posed) throughout the tour. FYI all of the photos they take are included in the price of your tour as a free download. I did take my camera along (with its neck strap, of course), and took some photos and a few videos, but it was nice to know that I could mostly just look around and not have to think about capturing the moment. 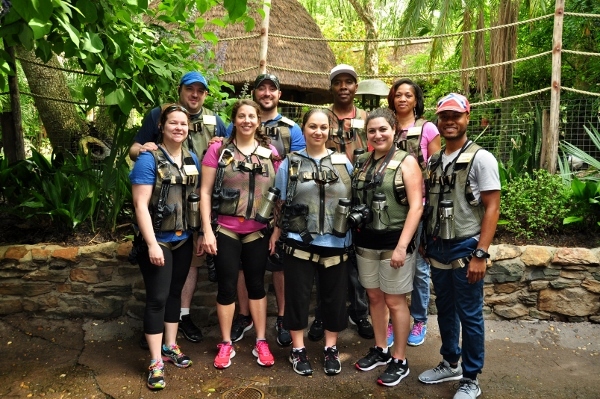 The group size for the Wild Africa Trek is a maximum of 12 people. Ours topped out at 9. We're ready to head out on our adventure! Our guides lead us out toward the Pangani Forest Exploration Trail where our tour begins. One of the great things about this tour is that you can ask as many questions as you'd like, so even though we are seeing some of the same exhibits as everyone else, we have a much more personal touch. 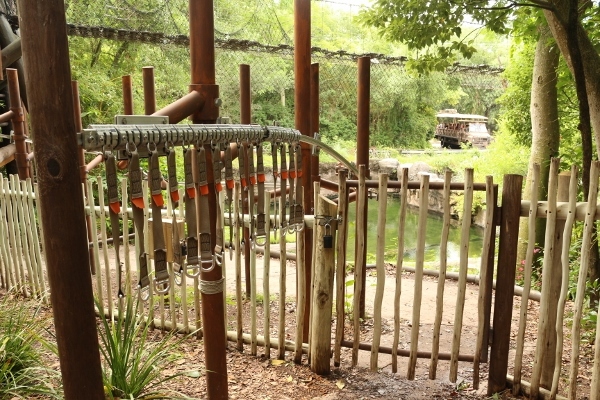 After heading through the aviary, we head off the normal path and onto a private trail. 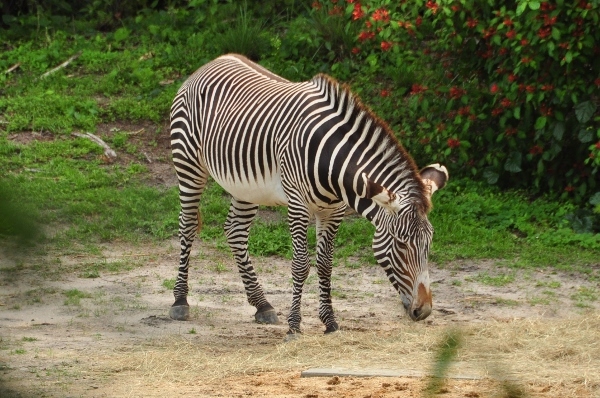 Here we get some views of more of the animals, and learn a few factoids about zebras. Did you know there are three different species of zebra? Common (plains), Grevy's, and Mountain. 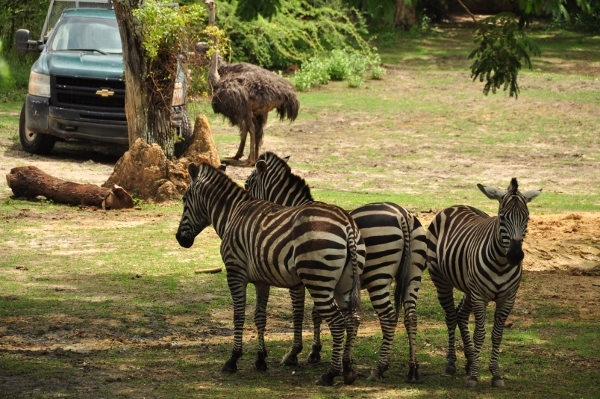 While the common zebras are seen on Kilimanjaro Safaris, we got a nice peek at these Grevy's zebras as we hiked through the forest. You can see how their bellies are white. On common zebras, the stripes extend further, covering their bellies more. 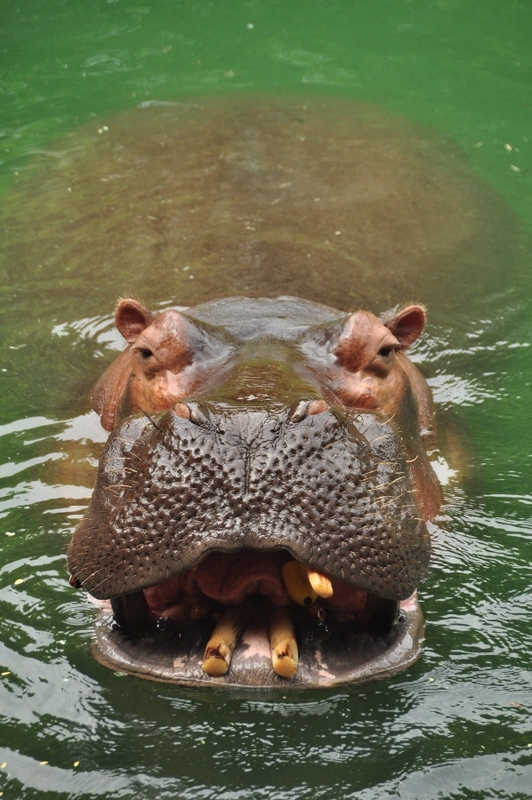 We headed toward the hippos next, and got a very up-close-and-personal look. 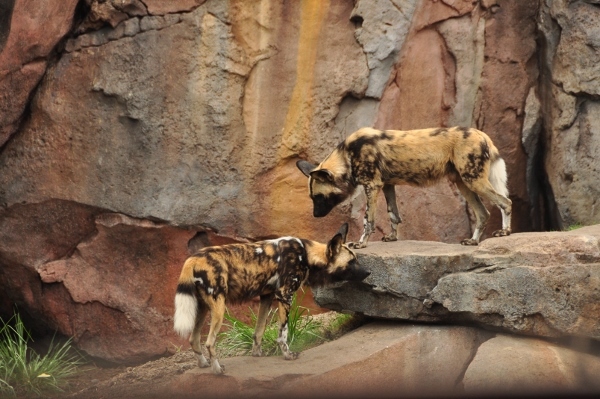 This was the first occurrence where we were clipped (via our harnesses) to a support railing so we could safely stand on an overlook above their pool. A "hippo expert" joined us (bringing along lots of lettuce) and shared more information with us while we viewed upon the hungry hungry hippos (haha) as they fed on lettuce. 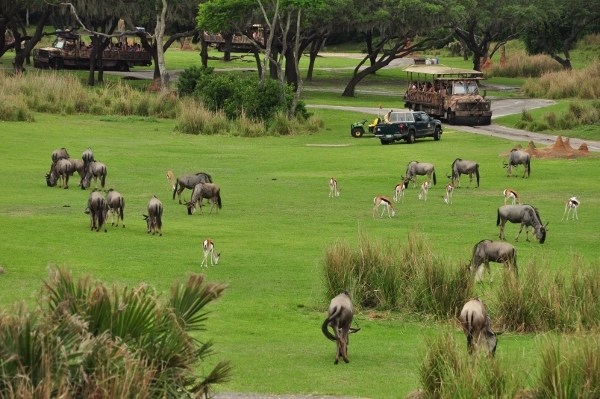 It was really great seeing them so up close, and it also felt pretty cool watching the safari vehicles drive by, while we had the best view in the house! 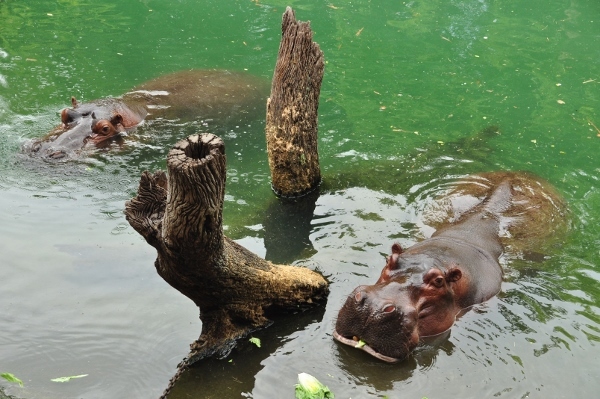 We said goodbye to our new hippo friends and headed onward towards the two rope bridges we would be crossing over the crocodile habitat. 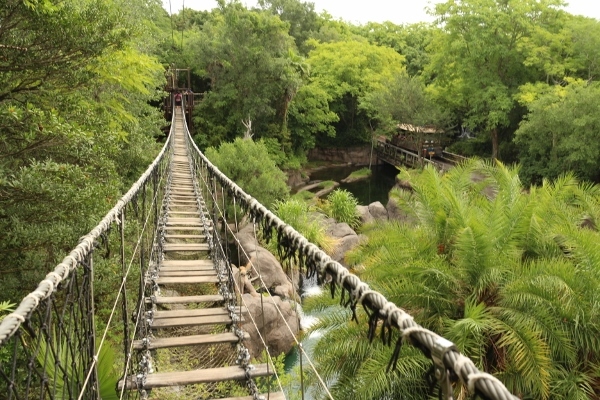 You've probably seen these rope bridges if you have experienced Kilimanjaro Safaris. Hopefully if you're doing the Wild Africa Trek, you're not afraid of heights. These rope bridges are completely safe to cross (I've heard the "rope" is actually made of steel). You are clipped via your harness to an overhead suspension cable. 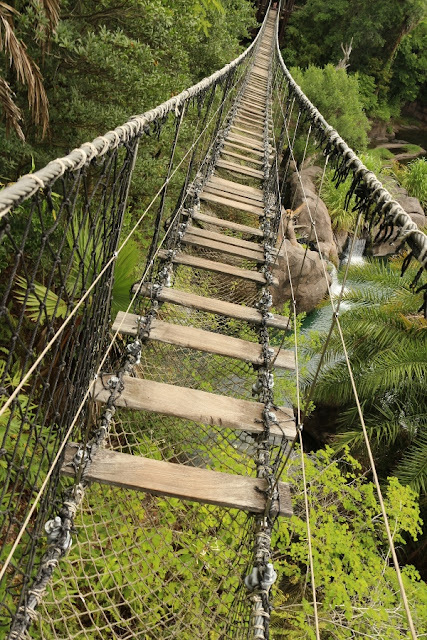 Although there are many missing boards on the bridge, there is a net below, so there is no way you could fall through the bridge. This was one of my favorite parts of the trek! I felt like a real Wilderness Explorer! 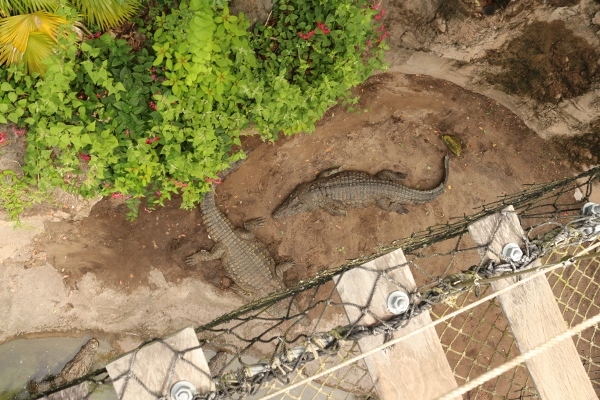 After traversing both rope bridges, the second directly over the crocodiles, you are clipped to another support railing which allows you to get a closer look at the crocodiles on another overlook. 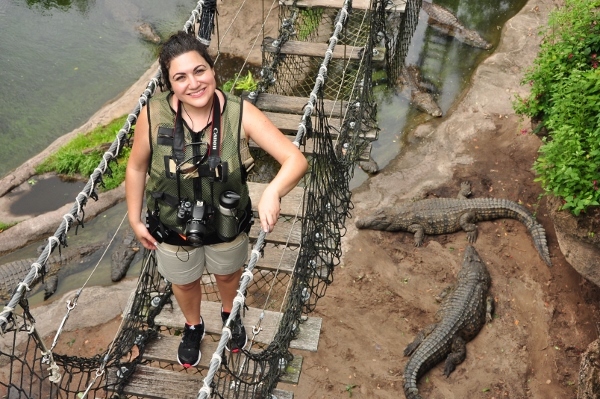 We were joined by a crocodile expert who shared more knowledge about these lazing creatures. 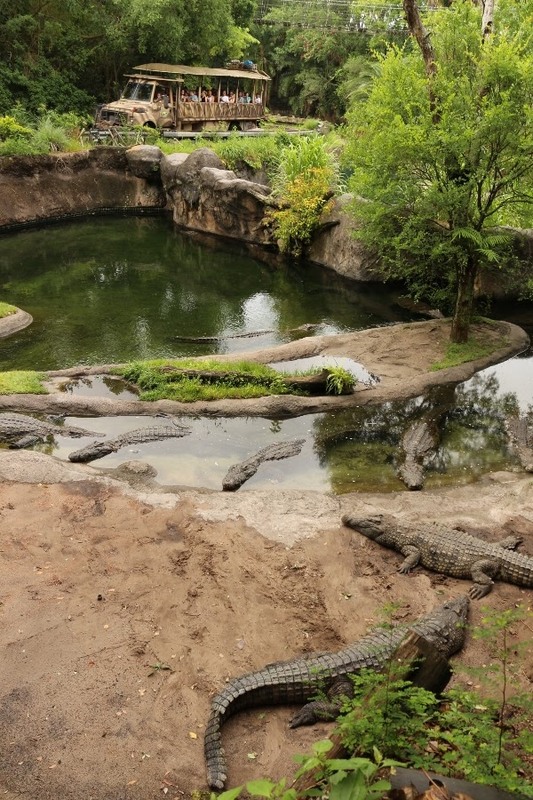 Did you know that these crocs are fed once a week (on Sundays) but that they can actually go a year without eating? That's pretty nuts! 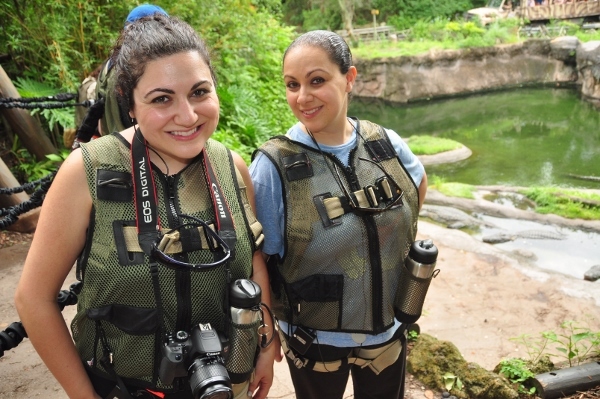 After saying goodbye to the crocodiles, we unstrap ourselves from our vests and harnesses, and hand over our earpieces. Phew, what a relief. 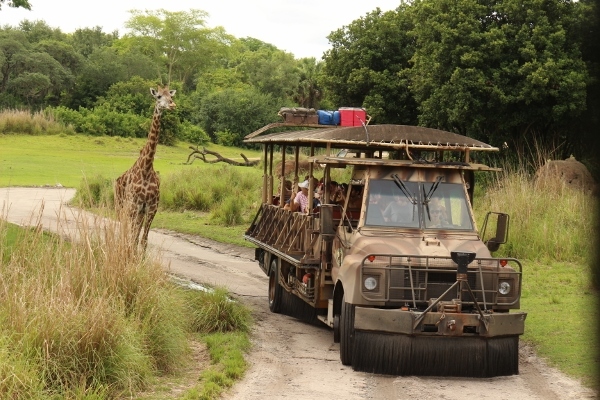 Here we board our special safari vehicle, which differs from the ones used at Kilimanjaro Safaris because it has benches on either side, so all passengers have a great view. We are also each given a Frosty Towel, which is the greatest invention for hot days since air conditioning. These towels are infused with essential oils, and stay nice and cool for extended periods of time. Our tour guides suggested we could wrap them on the backs of our necks for great cooling results. They can also apparently be reused (re-hydrated) as long as you don't wash them. 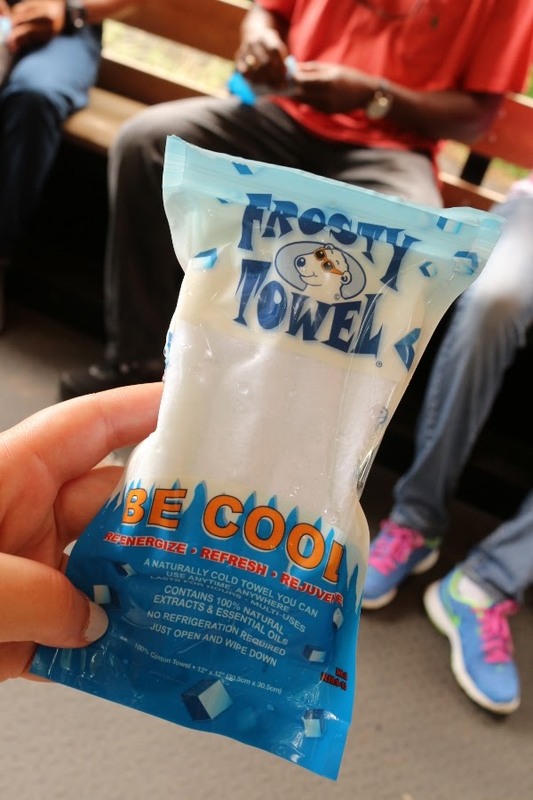 I officially love Frosty Towels! What a relief from the heat! 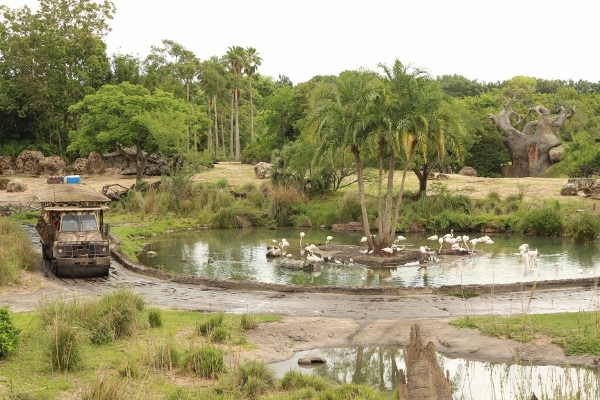 We head out on our safari, mostly following the same path as the Kilimanjaro Safaris vehicles, but occasionally pulling over to the side to allow us to stand up, getting a more relaxed look at these majestic creatures, take photos, ask questions, and more. 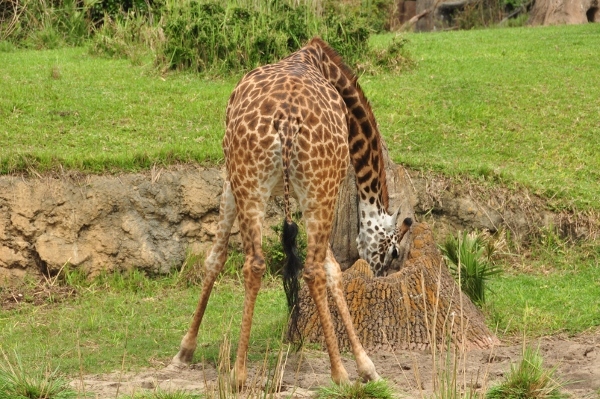 This is truly the difference from the traditional safari because you get a more intimate, un-rushed experience. 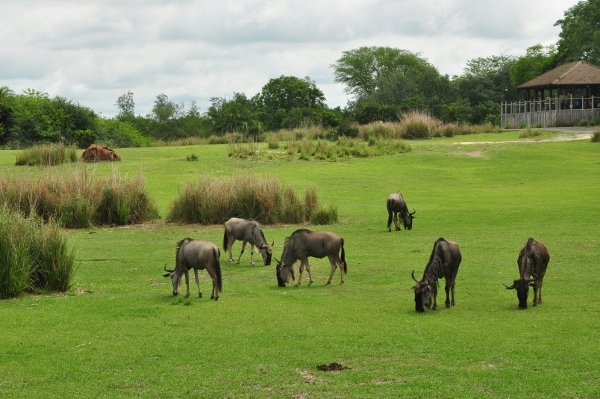 Wildebeests on the savanna. 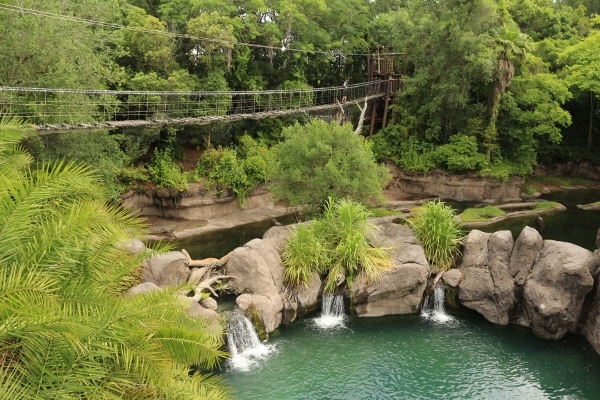 You can see the boma in the distance to the right. We are headed there next! 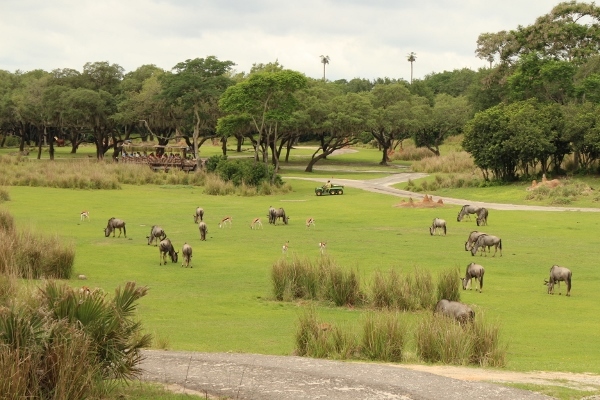 About two-thirds of the way through our tour, we diverge from the traditional Kilimanjaro Safaris trail and make a stop at a boma (or "safe place" in Swahili) overlooking a vast expanse of the Harambe Wildlife Reserve. 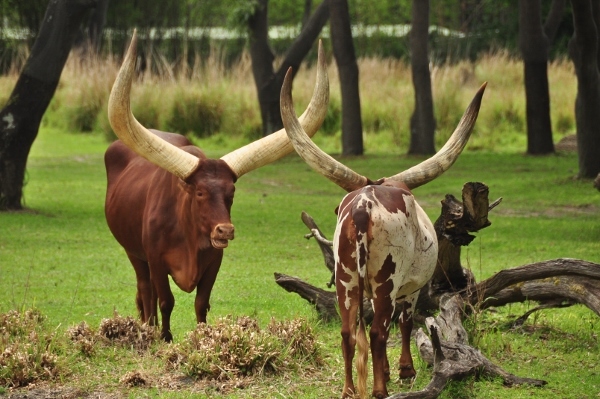 This is not to be confused with Boma, which is one of Disney's dining options over at the Animal Kingdom Lodge. 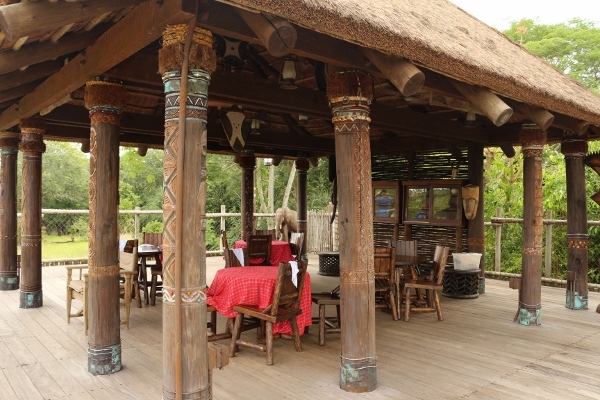 We spend about 30 minutes here at the boma. 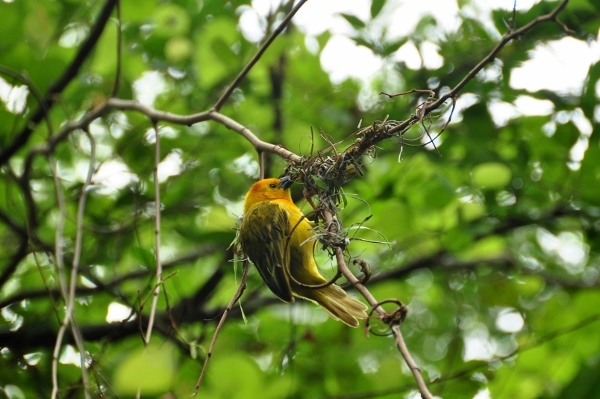 Binoculars are available to get a closer look at the animals, and bathroom facilities are also available for the only time on our trek. 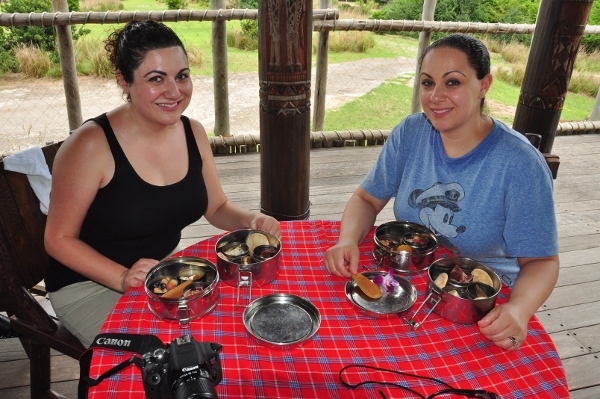 Shortly after our arrival, our guides get the tables covered with linens and distribute tiffins (stacked metal food containers) filled with African-inspired snacks. 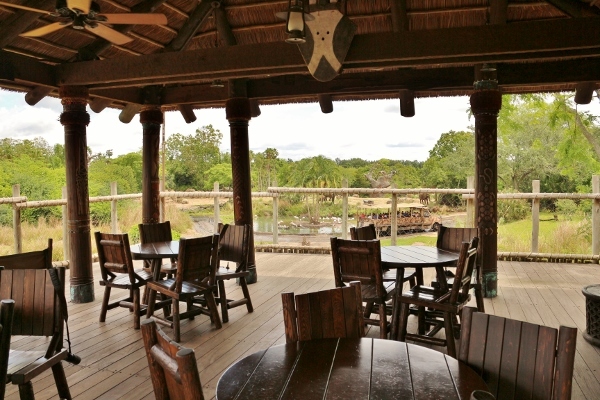 All of the food served on the Wild Africa Trek as part of this "Taste of Africa" is prepared at Tusker House in the Animal Kingdom, and cannot be found anywhere else at Disney. This dining experience is truly unique to this tour. The meals that are offered differ slightly depending on the time of day your tour is scheduled. For our 9:30 am tour, we received the breakfast-themed tiffins, while later tours would get a more lunch-themed version. 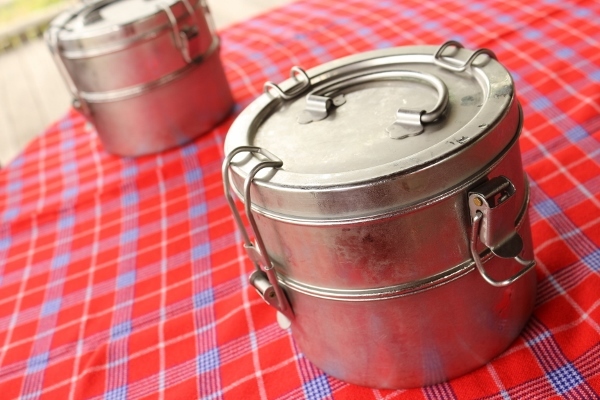 Each tray of the tiffin contains three round metal bowls containing different items. 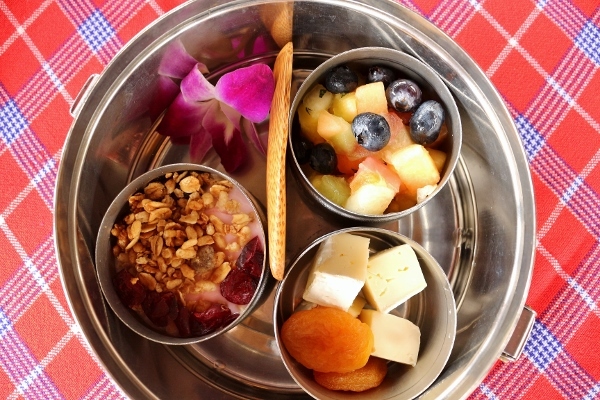 The first tin includes berry yogurt topped with crunchy granola and dried cranberries, fruit salad with a light mint-ginger dressing, and cubes of soft brie with dried apricots, along with an edible purple orchid. 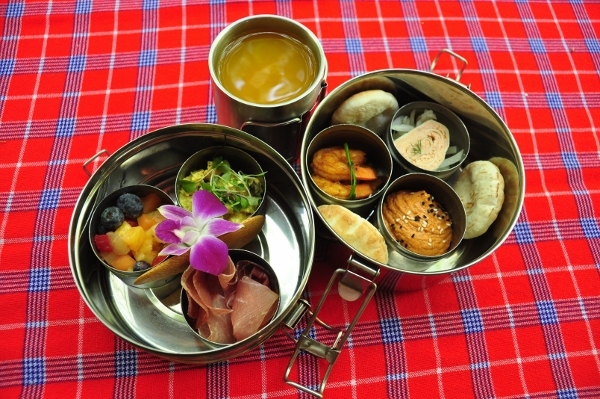 There is also a small bamboo spoon which can be used to eat the yogurt and fruit salad. That's really your only utensil other than your hands. 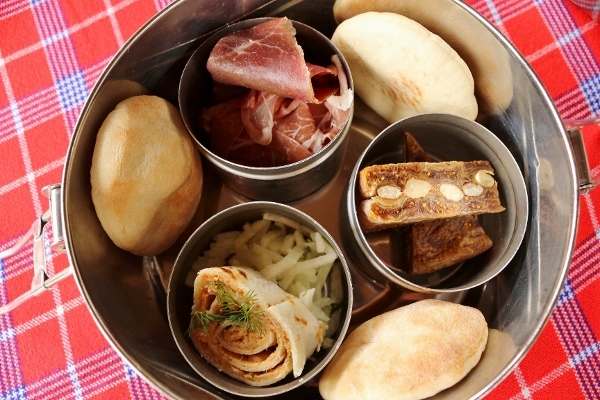 The second tin contains sticky fig and almond cake (a pressed cake, not a baked cake), salty prosciutto and bresaola, three small puffy pitas, and a salmon roulade made with barbecued salmon (prepared at Flame Tree Barbecue) mixed with cream cheese, wrapped in a traditional African potato bread, and topped with a bit of dill garnish. 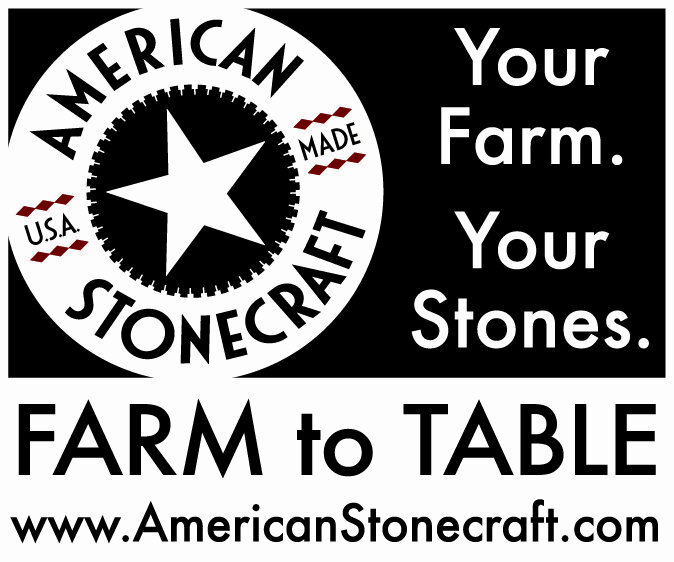 It's served atop a slaw of grated jicama and cucumber. There are also a a couple bottles of Jungle Juice (aka POG juice--passion fruit, orange, and guava juices) for everyone to share. 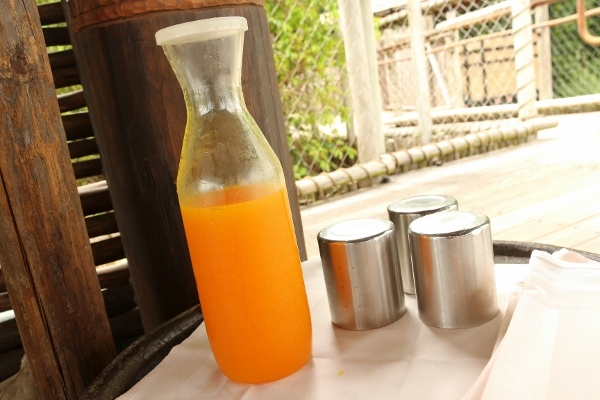 This juice can also be found at breakfast at Tusker House at Animal Kingdom, Boma at the Animal Kingdom Lodge, and Kona Cafe at the Polynesian Village Resort (called Lilikoi Juice there). It's excellent! Overall, even though these are considered snacks, the meal is quite satisfying. Our favorite item is the salmon roulade. We didn't really care for the jicama and cucumber slaw beneath it. It's pretty flavorless, and really only offers a textural contrast to the meal. I also really loved the brie and dried apricots, and the sticky, chewy and slightly crunchy fig and almond cake. 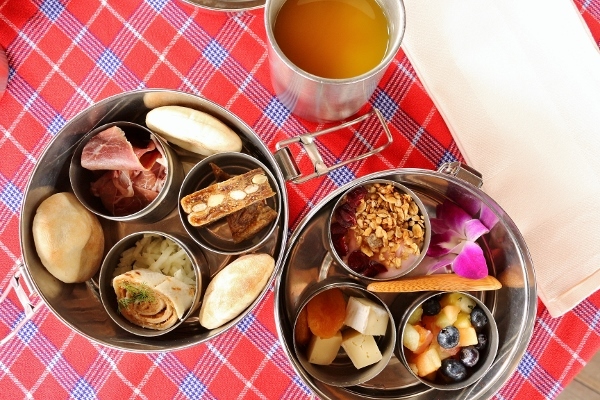 If your trek is one of the later time slots, you'll receive a different set of tiffins swapping out the yogurt, brie/apricots, and fig cake for curried chicken salad, tomato hummus, and cold spiced steamed shrimp. 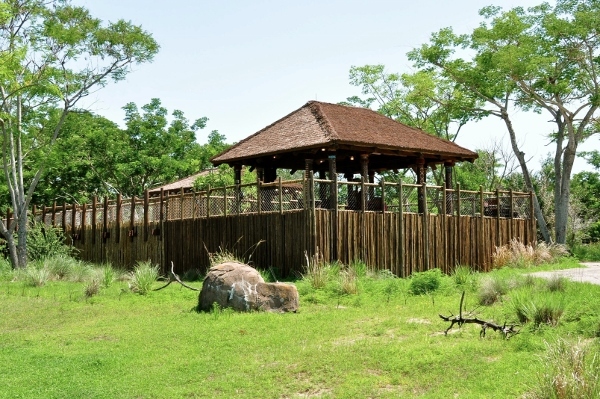 After we finish eating, we spend a bit more time enjoying the views from the observation deck of the boma. After the poop-holding, our break at the boma wraps up, and we head back into our safari vehicle to go see some more animals. 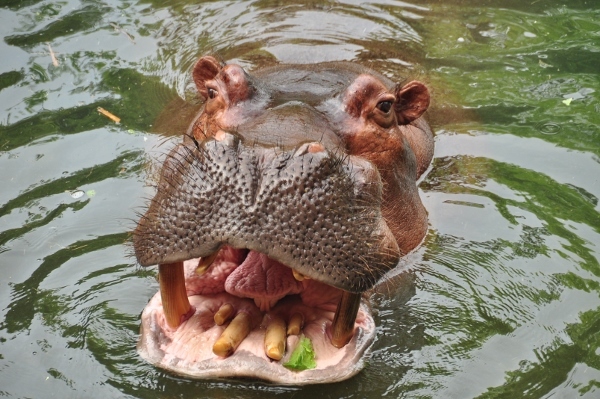 We also learn more great facts about these awesome creatures. 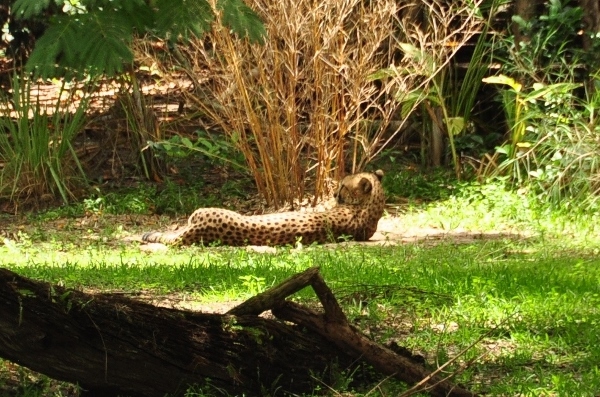 Did you know that a cheetah can go from 0 to 60 miles per hour in 3 seconds? Part of the reason they can go so fast is that they don't have retractable claws, so their sharp claws help them dig into the ground as they run, propelling them faster. 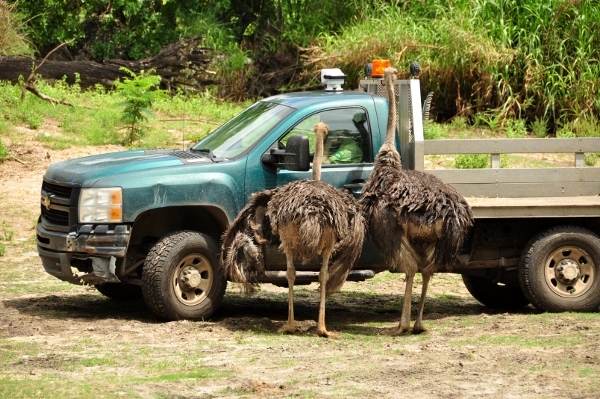 These ostriches are not very intelligent. They didn't move from that spot by the truck the entire time we were parked nearby. There was a man in the truck and they literally just stood and stared at him. Not sure what they were waiting for, but it was kind of hilarious to watch them. Silly ostriches! While we saw some Grevy's zebras earlier in our tour, here on the savanna there are common zebras roaming the grounds. 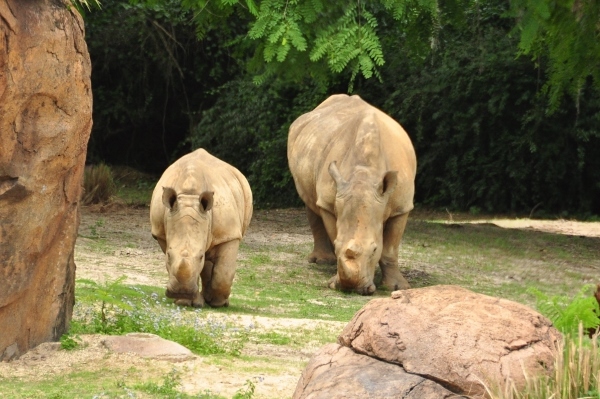 Can you tell the difference just by looking at their stripes? Hint: Look closer at their bellies! 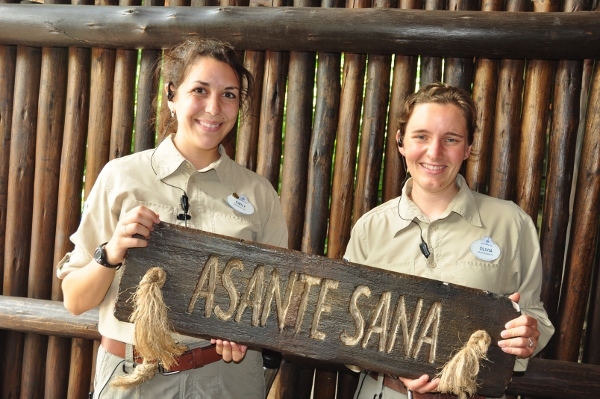 As we conclude our tour, we say asante sana (thank you in Swahili) to our guides and driver. 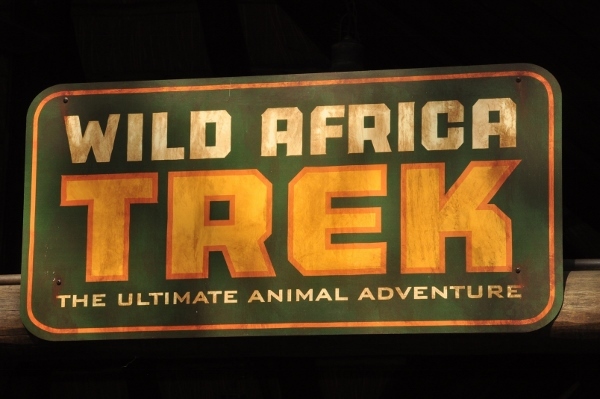 Part of the cost of the Wild Africa Trek is donated to animal conservation through Disney's Wildlife Conservation Fund. 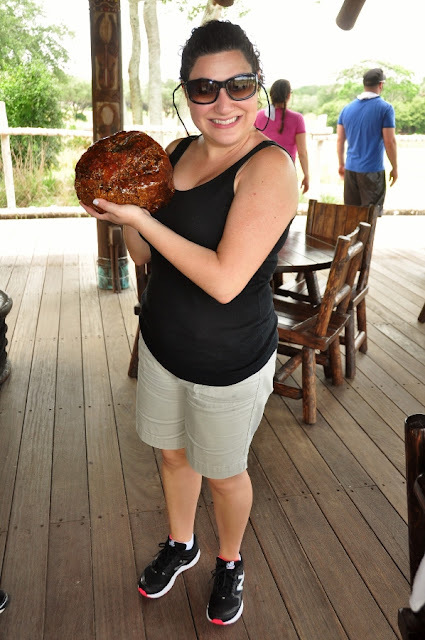 We were each given a stone to place into a box designating where we would like our donation to go: lions (and large cats in general), elephants, rhinos, giraffes, or general animal conservation. Wear closed-toe shoes with a back-strap, or hiking boots. Skirts/dresses are not recommended. Weigh at least 45 pounds and no more than 300 pounds. Be in general good health, and ambulatory, with sufficient stamina. Pregnant women should not attempt the Trek. Tours take place rain or shine (with the exception of lightning--the others on our tour had all been taking a tour the previous day that was cancelled partway through because of a thunderstorm, and were then rescheduled on our tour). 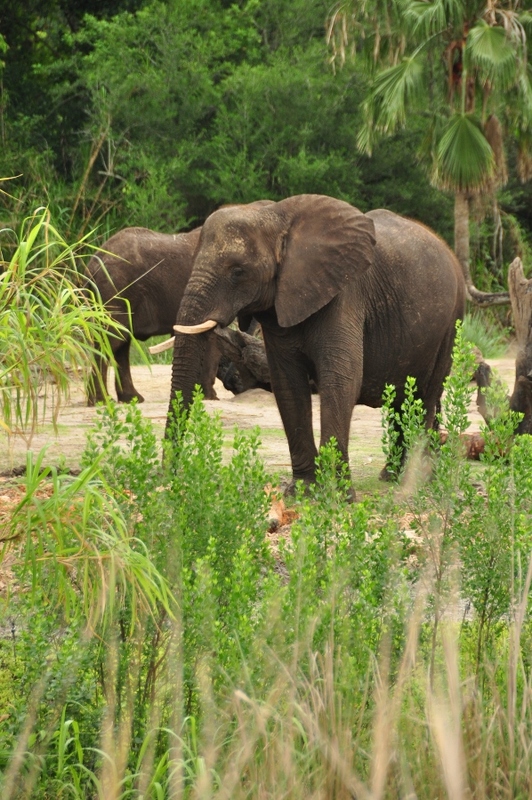 There is one bathroom break on the 3-hour tour (at the boma). 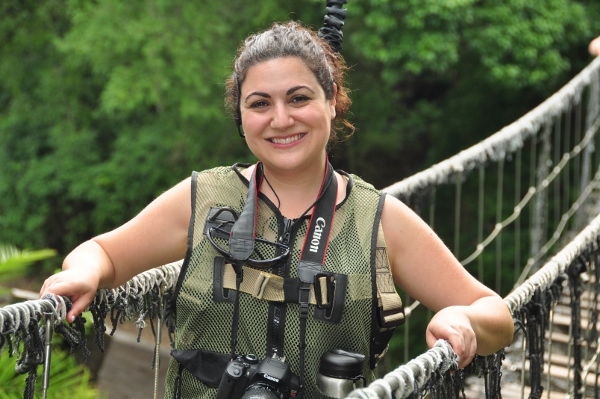 All cameras need to be attached to your vest, or have a neck strap. 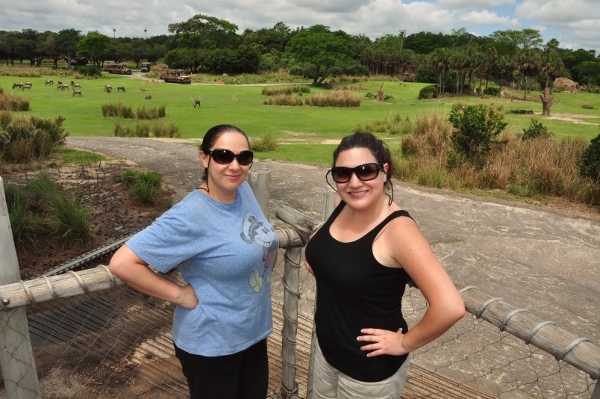 The Wild Africa Trek was very much a bucket list type of experience that my sister and I had both wanted to try for years. The price tag is pretty steep, but the experience is incomparable. 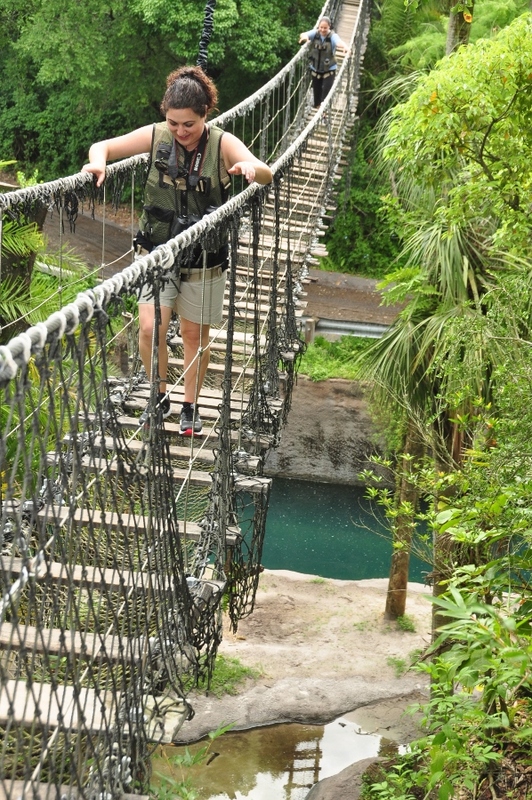 Kilimanjaro Safaris is not going to give you the same access that you get doing the Wild Africa Trek. You also get a pretty substational snack/meal, about a couple hundred free, high-resolution, downloadable photos from your tour, a souvenir water bottle, and so many memories. 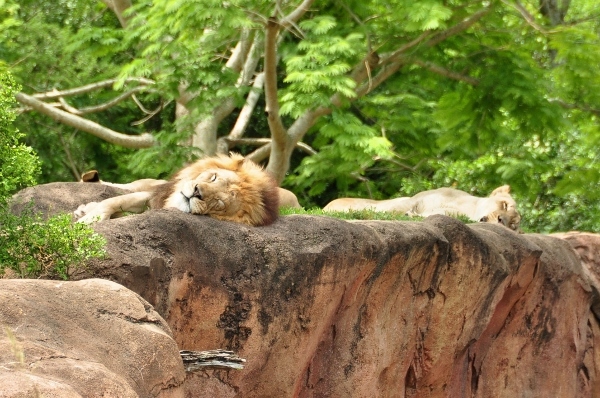 And of course part of your ticket goes toward animal conservation. I have absolutely no hesitation in recommending this tour. There are some opportunities to save a bit of money seasonally on certain tour times (for example, from now until October 22, 2016 they offer $50 off afternoon tours), so if that helps make your decision any easier, I say go for it!